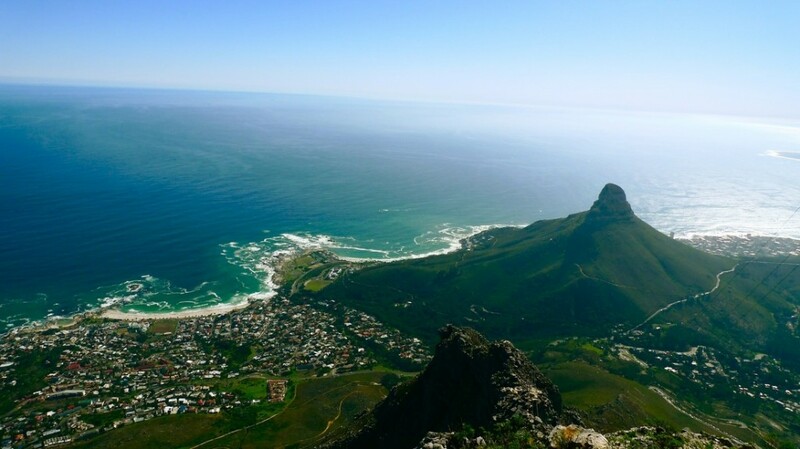 A beautiful, green, Lions Head - Cape Town. 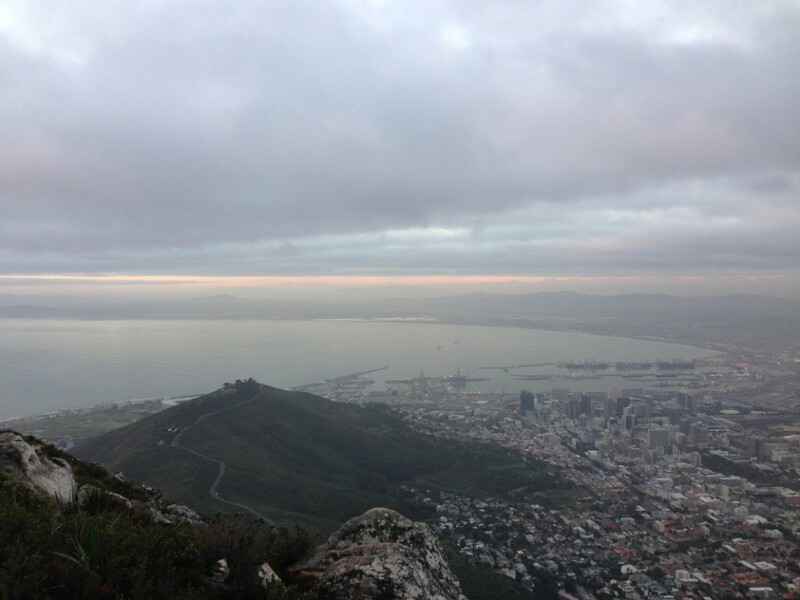 You haven’t seen Cape Town in all its glory until you have climbed to the top of Lions Head. Making the trek up this beautiful peak is inspirational, you wind your way around the mountaintop and in doing so are afforded 360 degree views of Cape Town city, the surrounding mountains, not least of which is Table Mountain and the Stellenbosch peaks, as well as incredible views of Cape Towns beaches, Robben Island and the Atlantic ocean. This is a climb we have made many times both before kids and after them. Pre kids, we used to climb to the top and then race each other down, before heading to one of the city’s quirky coffee spots for a little breakfast. After kids, we made the modification of adding a child carrier to one adult and a ‘cango pouch’ to the other, as well as a bag with diapers, wipes, bottles, sippy cups, fruit bars and lollipops (for when they have reached their limit). 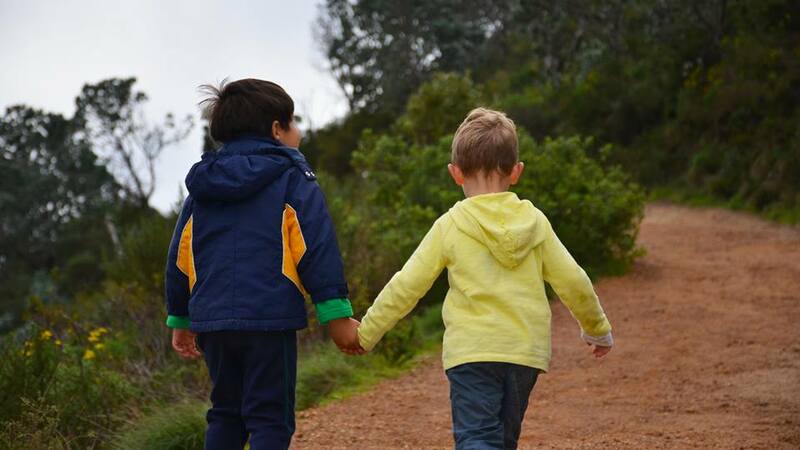 As time has passed we have managed to lose both child-transportation devices in lieu of throwing them onto our backs when they get tired, and replaced innumerable toddler ‘essentials’ with a handful of protein bars and a sports drink or two. 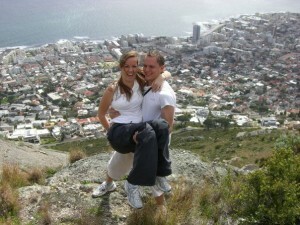 Climbing mountains has got considerably easier. 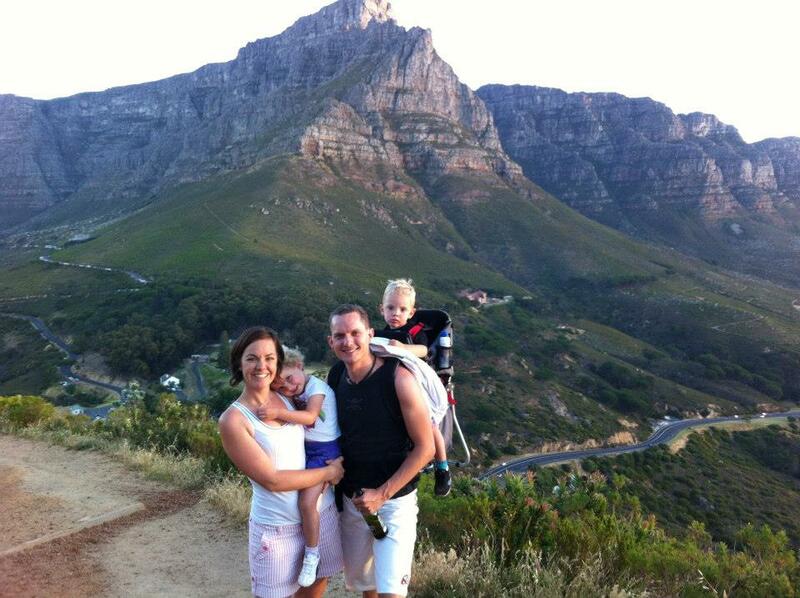 Climbing Lions Head pre children. 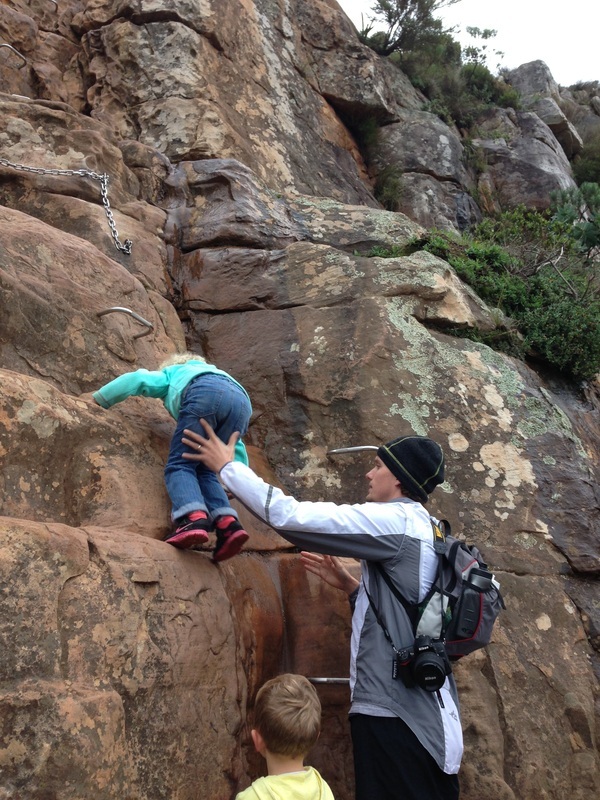 Climbing Lions Head with liiiiiiittle children. Climbing Lions Head with slightly more capable children. Caution!! Rock climbing training in progress! Nerves of steal required to view this picture. After a long period of training our children to hike with proficiency, we launched into an exciting adventure of heading up the mountain with, as the title suggests, not just our little family of four, but some extended family as well. 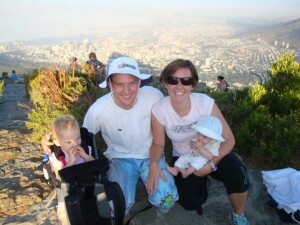 My brother, his almost six months pregnant wife and their two boys (aged twenty-three months and three years old). We dug out the child carrier, filled a bag with all the toddler ‘essentials’ and grabbed the protein bars and sports drinks. Off we set. 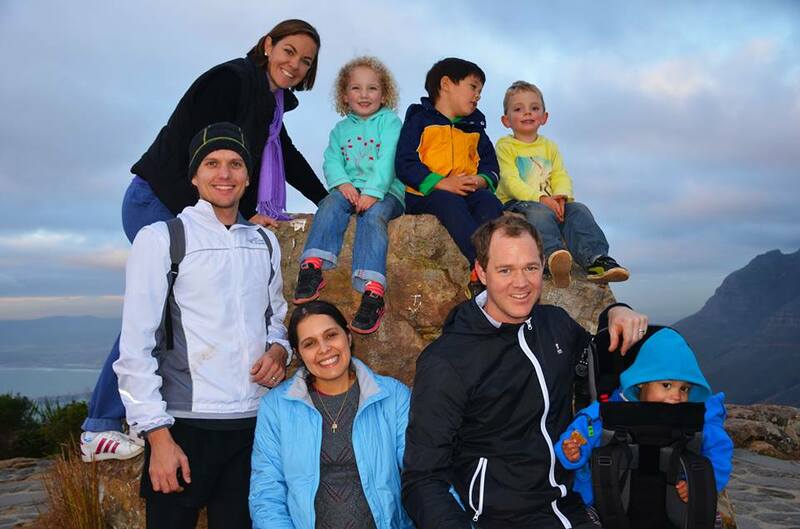 Mikey (my three year old nephew) last climbed a mountain as a four week old embryo inside his mother’s tummy, that was the last time we coaxed my wonderful big brother and his sweet unsuspecting wife up Table Mountain. 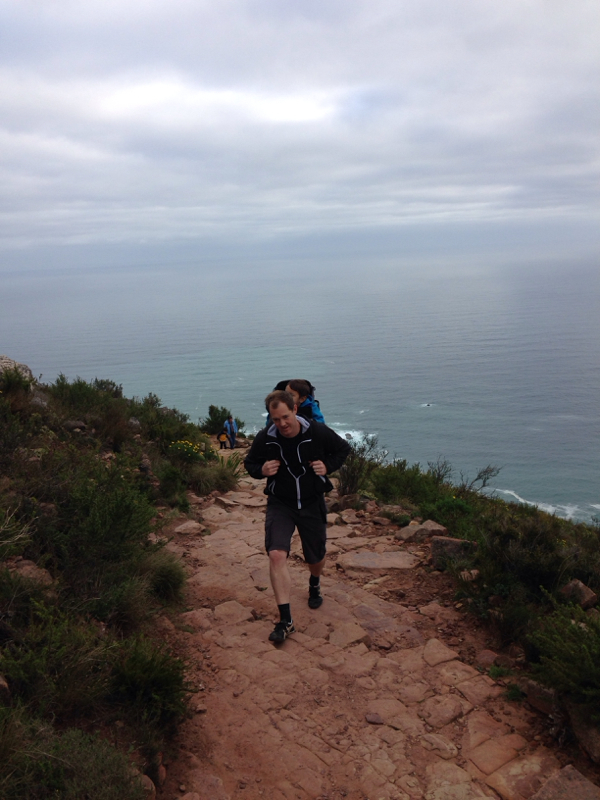 It must have done a great job in laying the foundations for great future climbing for Mikey, as he set off up Lions Head with sheer determination. Every step was calculated and the thought and energy that went into keeping his consistent pace was impressive. Every offer of a ‘lift’ from either his uncle or his aunt was politely declined. 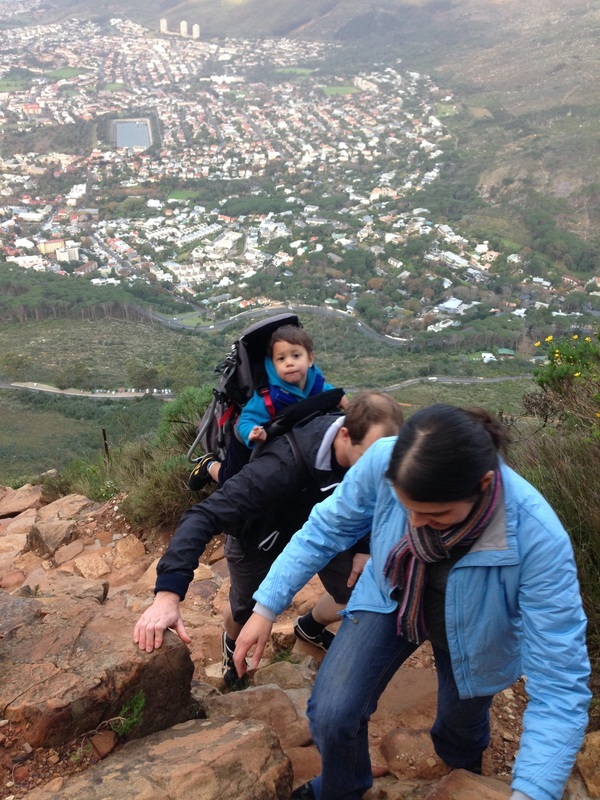 Danny (my almost two year old nephew) walked approximately 20 meters before he was hoisted into his carrier and strapped to my brother’s back where he remained, safely, for the duration of the hike. It has taken many years of hiking and climbing with our kids to teach them where to put their feet, what rocks to hold, what rocks not to hold and where to stand when they are waiting for us. 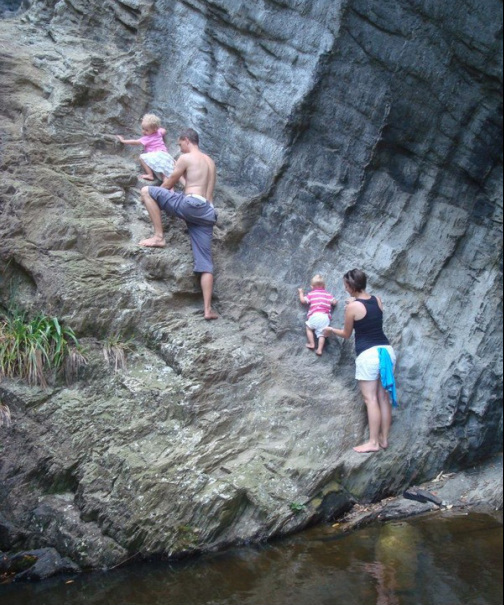 Climbing up ladders and rungs drilled into the rock requires agility on the side of the parents (you have to climb with them but not use the appropriate holds and foot rests because they are), as well as nerves of steel. Five years in and I still haven’t developed the steeliness needed to prevent clammy toes and moist palms. My poor sister in law didn’t know what she was getting herself into! 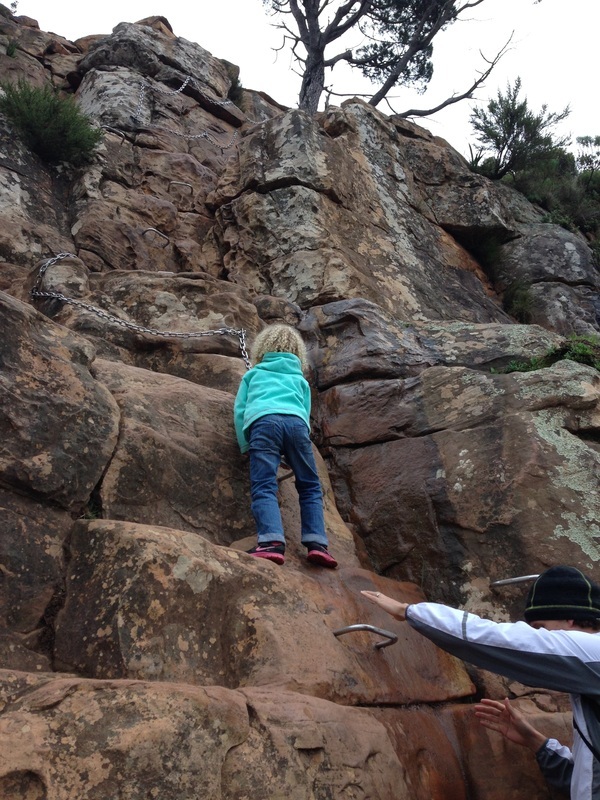 I’m sure she watched in more than horror as we guided her little three year old up the sheer rock face and out of her sight as she awaited her turn up the steely rungs of terror. Negotiating a six month pregnant belly up those rocks was a feat in itself and she put many a passer-by to shame as they huffed and puffed their way up, only to notice her belly and the pack of children and realise how easy they had it. As all three children reached the top, on their own, followed protectively by their hovering parents, the sun began to set. Anyone with an inkling of the effort it takes to get a troop this large just to the beginning of the hike, knows that we weren’t about to can the idea just because we left an hour after we were planning on setting out. This rather annoying deviation in time pushed us into the beautiful ‘sunset window’ at the top, but also into the rather perilous position of descending in the dark. Not first prize for a hiking party with more people needing to be carried than there were backs to carry them, but down we had to come. Opting for the less hazardous, slightly longer route down, left only one child lying on their back after trying to race ahead of his older sister (yes, Lincoln), but the rest of us set a steady pace climbing down the rocks and Shaun and I set about managing, carrying and herding the three children. Shepherding three pre-schoolers up the side of a mountain is intensive stuff, getting them down involves dogged determination, and muscles, lots of them. This was the first time we found ourselves outnumbered and out of time. There is no fast decent when moving in the dark, especially when you intend to get everyone down in one piece. Carrying a child on your back and holding another child’s hand utilises muscles I’m not sure I knew existed until the morning after our hike. Think of it as a continual bicep curl with your arm behind your back. Hoorah!! – Navy Seals here we come! Night time or no night time, I’m not sure I would recommend this hike if you intend taking your children up, unless you and your partner are relatively fit. Your children don’t have to be, as long as you turn around before they reach their limit, or you can carry them down. We would have been in rather a pickle if we weren’t able to carry the kids down, and the hike certainly wouldn’t have been as enjoyable. The best advice I can give is know your limits. That said, children have an amazing resilience and an ability often far beyond what we credit them with. Mikey, having never climbed before, was able to summit the top, entirely on his own, and he never once, not even on the way down, complained about his legs, the length of the hike or how dark it was. Our children are used to this craziness, but seeing how easily other children adapt when thrown in the deep end is inspiring, it makes me want to grab other parents by the collar and tell them to do more with their kids. Don’t be reckless, but get out into the wilderness and push yourselves to see more, experience more, climb a peak you’ve never summited and show your children how to enjoy the outdoors! It’s beautiful, it’s free, and it’s freeing. 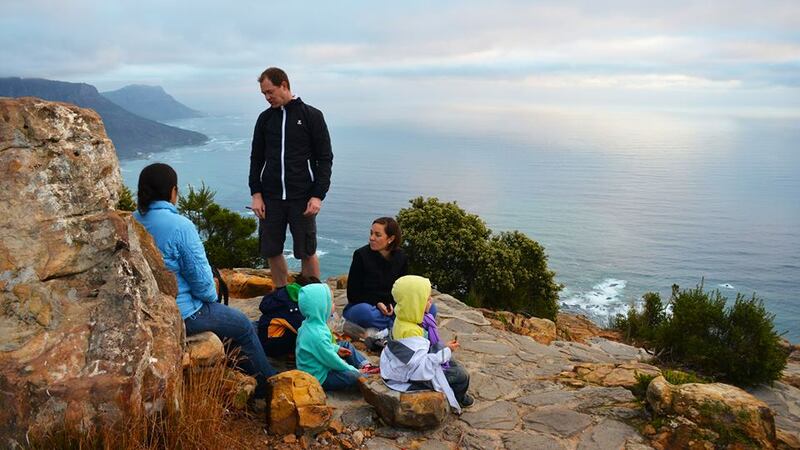 Go and breath some fresh air as a family, it’s never too late to start, and I can assure you – you won’t regret it. We planning on hiking this weekend, but im 4 months pregnant. Why didnt you hike it when you were pregnant? 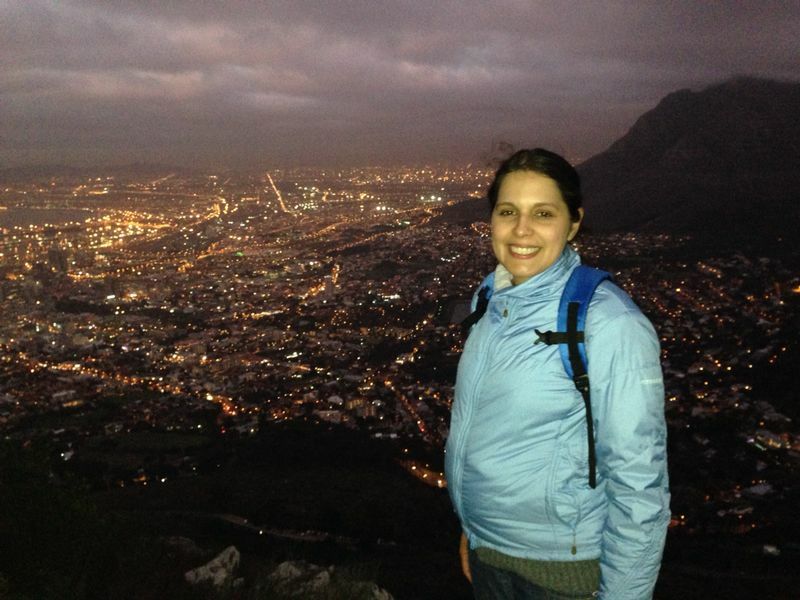 Is the hike to hectic for pregnant women?